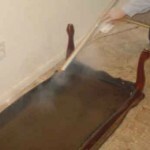 We offer steam and heat treatments to kill bed bugs in your home. Bedbugs are making a big comeback in the U.S., pest management companies are reporting a 95% increase in calls. They can be found in homes, apartments, hotels, motels, dorm rooms, shelters, movie theaters, schools and modes of transportation including moving vans. International travel has undoubtedly contributed to the resurgence of bed bugs in this country. How did I bring them home with me and now what do I do? Bed bugs are small, brownish, flattened insects that feed solely on the blood of animals. The common bed bug, Cimex lectularius, is the species most adapted to living with humans and probably originated from Bat bugs many years ago. They generally hide during the day and come out at night ready for a blood meal and that is YOU! They can go 18 months without feeding and people react differently to their bites. Don’t ever place your luggage on a dresser or on the floor of a hotel/motel, personally I place my suitcase on the bathroom counter. As you pack, place items into zip lock baggies and when you return home take the suitcase apart in the garage or outside. The name bedbugs does not imply that they only live in beds, they can hide anywhere – headboards, baseboards, wallpaper, alarm clocks and electronics, pictures and art, curtains or drapes, window frames, carpet and tack strips, peeling paint, box springs, dressers, clothes, chairs and sofas, basically any crack or crevice anywhere. I really think I can handle this on my own, what must I do? I must emphasize that this really a job for a Professional Pest Management company – you need the proper equipment to tackle this problem. You must kill adults and eggs. If you don’t, it can make it more of an issue later for the Pest Management Technician. 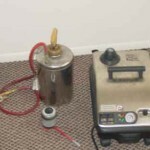 ProBest employs a Commercial steam machine, vacuum and the proper pesticides used according to Label and Material Safety Data Sheets instructions. We also sell box spring and mattress covers, “climb up” bedbug devices and other products designed to help you with this problem. Please call our office or speak to a technician about these products. 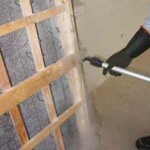 Fogging and the use of bug bombs will not work and often drive these pests deeper into cracks and crevices. 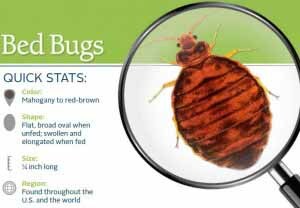 Bedbugs are extremely tiny and require a trained technician to explore your home on their hand and knees, looking at baseboards to the ceiling – it is a process and takes time and patience. That is what is needed to locate the possible harborage areas and then to treat and eliminate these pests. Have a ProBest Pest Management Professional contact you about our bedbug inspection and treatment options.